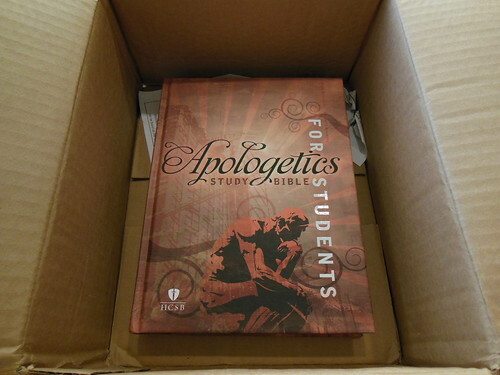 A Review of the HCSB Apologetics Study Bible for Students Indexed Hardcover Edition. I found this Bible to be significantly thinned out compared to the regular Apologetics Study Bible. This is targeted at teens and younger students. You can read my review of the Apologetics Study Bible here. 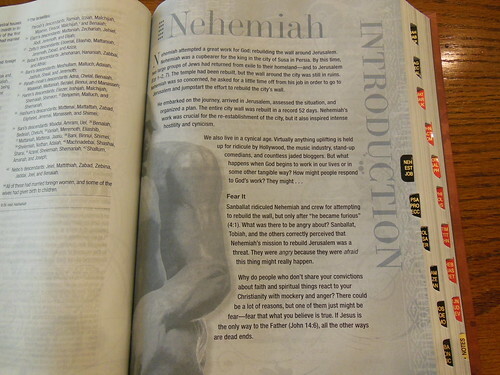 Keep in mind that this Bible is not the same as the Apologetics Study Bible, and it is intended for students. It would make a great Bible for young people with questions that you perhaps are not equipped to answer. Christian apologetics is the defense of the veracity of Christianity and its doctrines, by utilizing logic, reason, philosophy, and evidence. So when you think of a Bible including the word, “apologetics” in its title you would assume that it is going to be focused on apologetic arguments. 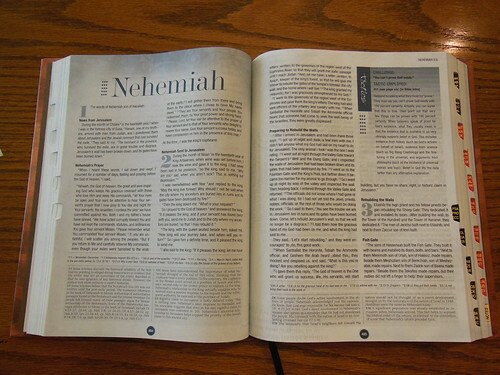 This Bible does not do as comprehensive a job as the standard one, but for the intended audience, it is just what is needed, without getting bogged down. There are several articles, and testimonies. One feature that is useful is the, “twisted scriptures” asides. There are 60 of them throughout the Bible. They take commonly misapplied scriptures, put them in the proper context, and explain the errors made with their application as well as the proper application. This should be very helpful for kids who have been exposed to cults by their friends. Mormons, Jehovah’s Witnesses, and all of the other repugnant cults, spread such lies about the Bible, that it is common to hear them repeated, even by kids raised in a Christian home. Another nice feature is the, “bones & dirt” asides. There are 50 of them placed all over the Bible. They add archeological evidence as an apologetic aid. Students can see physical evidence, coincide with the testimony of scripture. This support can tip the scales towards belief and acceptance, when doubts are raised by their peers. It also adds to their individual education. My review copy arrived damaged. It was packaged sufficiently. The damage looked like a problem from the factory. 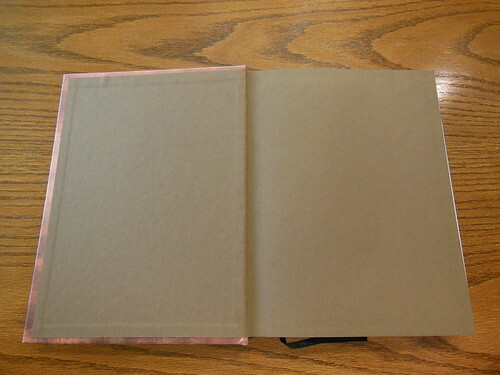 The end papers in the front as well as the presentation page, and the first pages of this Bible were deeply creased down the center. 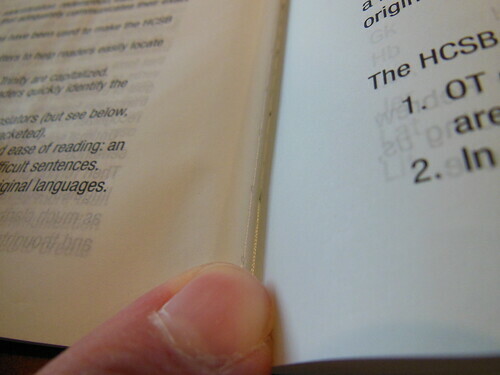 This is probably a fluke, but if you did get a damaged Bible, Holman will be quick to replace it. Generally speaking, you should return it to the retailer. The hardcover is pretty standard fare. The spine is sewn for durability, and flexibility. This ensures that it lays flat when opened. Overcasting was also employed, ensuring durability. There is one very thin, and unintentional looking ribbon marker. It just seems out of place. Given their exceptional use of overcasting contrasted with this anemic ribbon, I’m at a loss. I’m kind of a stickler for ribbon markers. 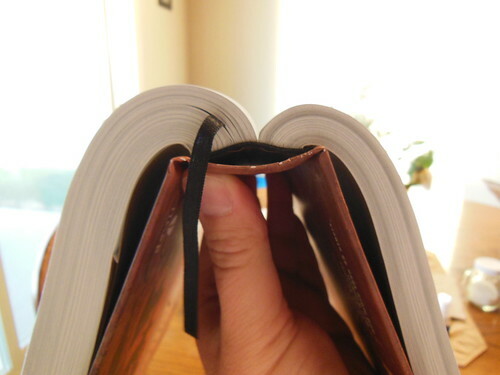 All Bibles should come with 3 ribbon markers that are wide enough to not bite into the page edges when opening the Bible with them. They should be thick enough to be durable. 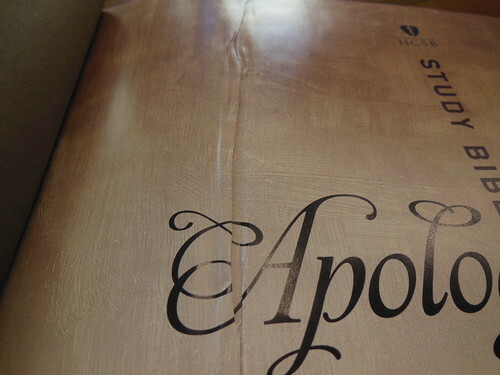 They should be thin enough to not leave grooves in the pages from when the Bible is closed on them. Finally they should not be folded haphazardly into the Bible from the factory. The paper is opaque enough and the font is 8 pt. in size. I doubt young people will have trouble reading this black letter edition. I do however, have some difficulty with the choice of font on the feature headings. It looks very much like stylized scribbling. The font is arranged in a double column format with notes and references at the bottom. The book introductions and articles are well done. They should be helpful to the young reader. I do not like the index tabs. In my opinion they are not as easy to use as the crescent cut ones. Your opinion may differ. All in all it is a descent Bible for young people. It is not sufficient to serve as a study Bible for a mature Christian. Here is a list of features it has. 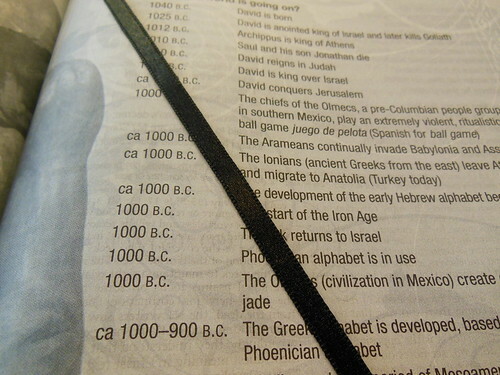 Please don’t forget to look at the pictures I took of this Bible here on my flickr page. Modern American culture places a dubiously high value on individual personal happiness. Sorry, that one was given away to someone I know locally.